RIVERSIDE, Calif. – Dixie State is back in the PacWest men’s basketball championship game for the first time since winning the tournament in its inaugural year. The No. 1-seeded Trailblazers defeated No. 5 Concordia, 68-59, in the semifinals on Friday night to set up a final with No. 2 California Baptist. The win is the 16th in a row for Dixie State, which has not lost in 2018. The Trailblazers improved to 22-6 on the season, going into Saturday’s final. Concordia wrapped up the season with a 20-11 record, advancing to the tournament semifinals in its first year in the tournament. Dixie State relied on its defense in the win, holding Concordia to under 40 percent shooting from the field and forcing 18 turnovers. PacWest Defender of the Year Trevor Hill had a team-high four steals. Hill also was one of three players to score a team-high 10 points. Six players in the Dixie State roster finished with between eight and 10 points. Quincy Matthews made a 3-pointer with 12:32 left in the game to give Dixie State the lead for the rest of the game. The trey sparked an 8-2 run in which Matthews scored five of the points. Concordia pulled back within three, but Austin Montgomery came up with a lay-up and then a big dunk a couple minutes later to give Dixie State a 64-56 lead. The Trailblazers defense took care of the rest, holding Concordia under 30 percent shooting in the second half. Isaiah Clark made 5 of 6 field goals to finish with 10 points and eight rebounds, while Matthews also had 10 points with a team-high nine rebounds. The Trailblazers winning streak will next be tested by California Baptist in the first meeting in PacWest history between the No. 1 and No. 2 seeds. Both teams won at home in their regular season meetings. Dixie State won the second of those two games, taking out California Baptist in overtime as that win proved to be the difference for the PacWest regular season title. The two teams are both in their last season in the PacWest, with Dixie State joined the Rocky Mountain Athletic Conference next season and Cal Baptist moving up to NCAA Division I status and joining the Western Athletic Conference. The Lancers beat third-seeded Azusa Pacific 67-57 in the other semifinal on Friday. 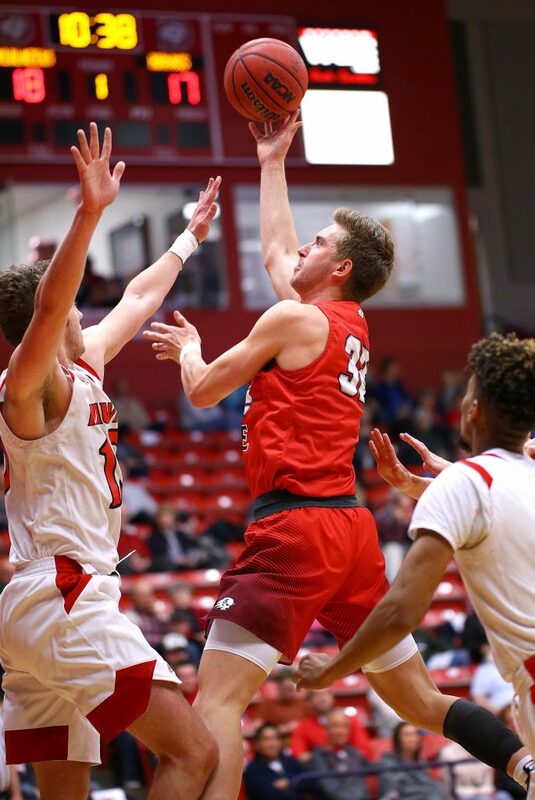 Saturday’s championship game will tip off at 4:30 p.m. Pacific Time (5:30 p.m. in Utah) and can be watched online by clicking on the appropriate link on the DSU basketball schedule page.